Evolution "Bones" Seat Tower is the latest development in strong, lightweight seat tower design, and yet this seat tower takes it even further than last years Skeleton Tower!! Strengthened at the leading edge of the footprint where the majority of the stress is, this new tower will take all you can dish out. With over an inch of travel at the center of the seat plate, this tower has a rock solid feel on take-off, and can still take the edge off the hard impact of landing those huge airs. Also new for the Evolution Tower, the seat plates have been turned inside out showing off the "Bones" of the seat tower! Comes assembled & complete with carbon fiber seat plate, seat belt & swivels. 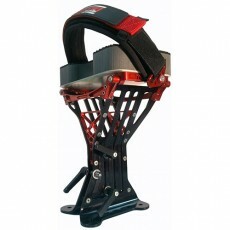 Though any Sky Ski t-bar can be use with the Evolution Seat tower, some strut tops may need slight modification to fit. Download the instructions & template for the modification here.